So instead, I’ll say that the 2015 Superior “Fall” Trail Races are going to be fun, fast, and uniquely challenging – as they always are. They will be the best, biggest thing in Minnesota trail racing since last year’s race, and they’ll be the best and biggest thing until next year’s race. That said, here are a few things to look for this year, if you really want to geek out. The Superior “Fall” Trail Races – featuring point-to-point races of 100, 50 and 26.2 miles – are one-of-a-kind. They traverse the jagged peaks and valleys of Minnesota’s Sawtooth Mountains, covering the hardscrabble rocks and roots of the Superior Hiking Trail along the watery knife’s edge of Lake Superior on the cusp of autumn. The routes are rugged, relentless, and remote. With excellent race organization and support, these are challenges runners of many abilities can complete. But for those interested, here is a quick look at how the races might shake out at the front. Spoiler: weather allowing, there is a chance 2015 will be the fastest any of the races have ever been run. 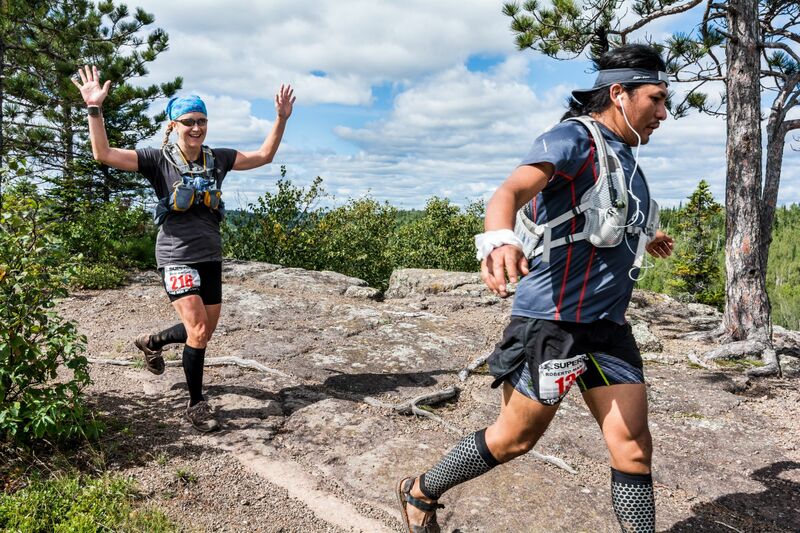 Founded as one of the original dozen-or-so 100-mile trail ultras in 1991, the Superior 100 (actually slightly longer at approx 103 miles) undergoes a slight course reroute this year. It still starts at Gooseberry Falls State Park and finishes at Lutsen – taking runners through such north shore gems as Split Rock Lighthouse State Park and Bean and Bear Lakes – but in 2015 the route will be pavement-bound for the first four plus miles on the Gitch Gami State Trail, a walking and biking path adjacent to Highway 61, while the Superior Hiking Trail Association reroutes a section of trail which was closed for the 2015 hiking season. In the men’s race, defending runner up from 2014 Michael Borst, 22, of La Crosse, Wisconsin, is back, but will have competition from his training partner (and pacer at last year’s 100 mile race) Jake Hegge, 24, of Onalaska, Wisconsin. Borst beat Hegge at the Zumbro 100 in April – they were both under the old course record – but Hegge exacted revenge with an emphatic win at the Voyageur 50 in July. While “the La Crosse Boys” are deemed more or less unbeatable, if either falters, plenty of talented runners will be waiting in the wings to take advantage; among them, Samuel Jurek, of Oak Bluffs, Massachusetts who is no stranger to Minnesota Ultrarunning, or Mike Dietz, of Wauconda, Illinois. Jurek – no relation to Scott – has a sub-17-hour 100-miler under his belt from Vermont, and has a slew of impressive results from the Spring Superior 50K and Voyageur 50, so he knows the trail. Beyond that, the field is deep and full of a who’s who of Minnesota ultrarunning; maybe Bob Gerenz will surprise some people with his “old man-strength”, or Duluth’s Eric Nordgren will harness his intimate knowledge of the trails. On the women’s side, there always seems to be one or two contenders who come in with a head of steam, having been unbeatable that year – a Becky George, Christi Richards, or April Anselmo. While it’s not quite as clear-cut this year, Mallory Richard, of Winnipeg, has got to be the favorite; she has a Superior win under her belt and won this year’s Black Hills 100 Mile overall – not just among females and could threaten the course record. Beyond her, it’s wide open; fellow Manitoban Sue Lucas or Baldwin Wisconsin’s Alex Eichman could also contend, among others. For what it’s worth, women comprise only 44 of the 249 entrants in the 100-mile race – less than 20% of the field. The 50-mile race – which starts in Finland and finishes at Lutsen, treating runners to the existential crisis that is the Crosby-Manitou section – has a pretty clear favorite, and that is Chris Lundstrom. Lundstrom, 39, of Minneapolis, has won the Spring 50K four times and holds the course record; the 2:17 marathoner ran in three different Olympic Marathon Trials and ran professionally for Mizuno and Team USA Minnesota until a few years ago. His 50-mile debut was at a little race called The North Face Endurance Challenge in San Francisco, where he was third in 2009 and seventh in 2010. But young whippersnapper Chase Nowak, 26, of Plymouth, Minnesota, might be nipping at his heels after going under the Chippewa 50K course record (in 3:47:43) en route to a runner-up finish at his first ultra in April. Edina’s John Horns is also entered, and only a fool would underestimate the 53-year-old for his age; Horns has won both the marathon and 100-mile here before, and he comes form the same bloodline as the nation’s top-ranked high schooler at 3200 meters last spring (Hopkins’ Joe Klecker, whose mom, Janis, is John’s brother). A win here would make Horns the first runner to win at all three distances. In what is likely not a uniquely Minnesotan move, but characteristic of those that not only participate in trail races in the are but also dominate them – Horns is rumored to be helping with course marking the Thursday before his race. As with the 100-miler, men vastly outnumber women entered in this 176-person field. Unlike the 100, there is less of a clear-cut favorite on the women’s side. Potential contenders should include Stacia Broderick, of Oak Bluffs, Massachusetts, Lindsay Dial, of Nashville, Tennessee, and Ontario’s Linda Walsh. The shortest course still covers one of the best pieces of trail – the climb from the Temperance River to Carlton Peak – en route to Lutsen. This might be the fastest field of them all. Wynn Davis, 34, of Stillwater, Minnesota, holds the course record in the marathon from his win in 2009; he has also demonstrated extraordinary range in winning the 100 in 2007. (We believe Horns is the only other runner to have wins at both distances.) Ben Kampf, 29, of Minneapolis, is just about unbeatable at the 25K – 26.2-mile distance on trails and has won this race each of the last two years, though Davis’ course record remains elusive. They’ll be joined by James Sorensen, 33, of Minneapolis, who was second to Kampf last year and who holds the 50-mile course record from 2012. The women’s race again remains more open. Erin Bell, 42, of Minneapolis, won the Surf the Murph 50K last fall, her debut (and still only) ultra; Mandy Rupp, 28, of Cincinnati, Wayzata’s Kelly Johnson, 30, Amanda Ulrey, 24, of Jackson, Missouri, and Eagan’s Anne Walztoni, 42, are all similarly matched based on their past race results. They could be joined by a slew of others. This year’s Superior “Fall” Trail Races, the 25th edition since the 100’s founding in 1991, include runners from 36 states and five countries. Race founder and original race director Harry Sloan, as well as his co-director Tami Tanski-Sherman, will be inducted into the Superior 100 Hall of Fame this year by the current RD and race committee. Harry, with a dozen Western States finishes between 1983 and 2004 was too busy (creating) and directing the Superior 100 in the early years to ever consider running the race, but now at the age of 67 will be participating for his first time in the race he created. The three living people with more than ten Superior 100 finishes are all running the race this year as well. -Chris Hansen, Nisswa, Minnesota: 10 finishes. * The only other runner to have ten or more finishes is Eugene Curnow, the founder (and now namesake) of the (formerly) Half Voyageur Trail Marathon. The trail / ultra / running community in Minnesota is as tight-knit as I have witnessed anywhere – many of this years participants are running in memory of two Superior Trail Race veterans; Aaron Buffington who passed away this past February at the age of 41 after a courageous battle with kidney cancer and Greg Riebe who passed just one month earlier, unexpectedly at the age of 46.